rule (Buy – if cadle closes above 5 EMA and Sell if candle closes below 5 EMA). 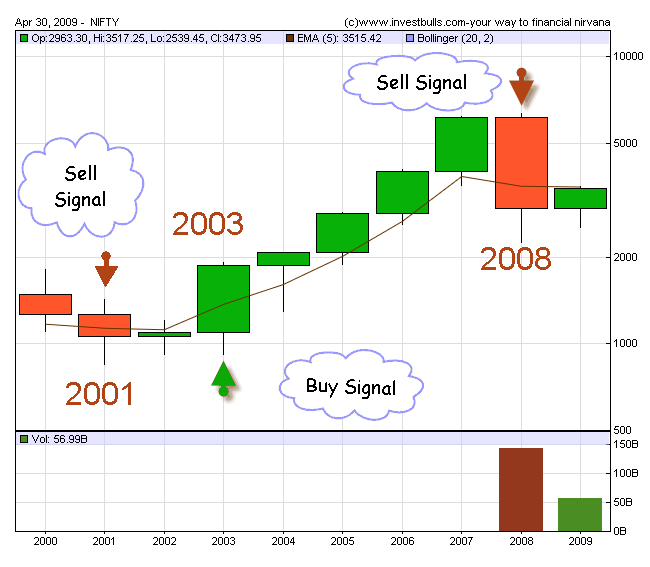 a sell signal during 2008 when it dips below 3800 levels during OCT 2008… ie below 5EMA. This might be one of the reason why we are facing much resistance near 3515 levels. year 2009 and even sustainability above 3515 will be Possible only for a shorter duration of days. And more possibly 31'st Dec 2009 should likely to close below 3515 levels. Still 8 more months remaining for the Year 2009 to End and I prefer to be a short term investor in Heavily Beaten down Stocks for the year of 2009 rather than investing in fat stocks those trades above 200 day MA and 200 Week MA for best short term returns. Hi Selva,Thanks for following me. Market would be very tricky if falls below 3250 levels before elections…. and make rise after election towards 3750 levels…. And this kind of this move is very trick to trap investors at higher levelsLooks markets are good after election in shorter duration@Rashmi and SelvaStocks will be reviewed here at appropriate timein my blog when there is enough oppurtunity to invest in the market.